NOW comes standard with the High Security ABLOY® EXEC series lock with restricted keyway.The EXEC series lock offers extreme security and over 300 million key codes available. The ABLOY® EXEC cylinder has an advanced disc-steering system to provide smooth and reliable operation. Austempered Ductile Iron (ADI) greatly increases the overall toughness of the lock body. The ADI body in combination with the special insert offers excellent resistance to flame or stone cutting. Stainless steel "dead-bolt" locking bar provides the highest security locking mechanism available. Locks on without the use of the key or other inconvenient installation tool. Fully enclosed to aid in grease control. 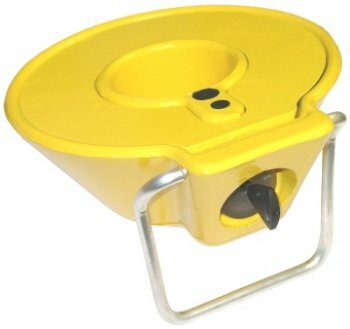 Conical 8" body resists trailer theft by use of "modified fifth wheels"
Safety yellow color with identification flag signals driver of use and provides a clear visual deterrent. Can be individually keyed, master-keyed, grand-master-keyed, and even keyed to match our ABLOY® padlocks.